^ Cardiff City £6m Malaysian takeover approved. BBC Sport. 27 May 2010 （英语）. ^ Cardiff hope on Far Eastern Promise. BBC Sport. 2010-05-23 [2012-06-11] （英语）. ^ Cardiff City football club: Should fans see red over shirts?. BBC News. 2012-05-09 [2012-06-11] （英语）. ^ Cardiff City could rebrand from blue to red. BBC Sport. 2012-05-08 [2012-06-11] （英语）. ^ Cardiff City shirt change proposal angers fans. BBC News. 2012-05-09 [2012-06-11] （英语）. ^ Cardiff City FC drop plan for red shirts instead of blue. BBC News. 2012-05-10 [2012-06-11] （英语）. ^ Chairman Dato Chan Tien Ghee reassures Cardiff fans. BBC Sport. 2012-05-15 [2012-06-11] （英语）. ^ Cardiff City to change kit from blue to red amid financial investment. BBC Sport. 2012-06-06 [2012-06-11] （英语）. ^ Cardiff City owner Vincent Tan agrees return to blue home kit. BBC Sport. 2015-01-09 [2015-01-10] （英语）. ^ Moor, Dave. Cardiff City. historicalkits.co.uk. [2 December 2011]. ^ Cardiff City badge: Bluebirds reveal new club crest for 2015-16. BBC Sport. 2015-03-09 [2015-03-12] （英语）. ^ Work starts on Bluebirds stadium. BBC News. 2007-02-21 [2009-06-25] （英语）. ^ Cardiff teams agree ground share. BBC Sport. 2007-09-19 [2009-06-25] （英语）. ^ City ground 'delayed to May 2009'. BBC News. 2007-09-07 [2009-06-25] （英语）. ^ Celtic to open new Cardiff ground. BBC Sport. 2009-04-22 [2009-06-25] （英语）. ^ Cardiff confirm Valencia friendly. BBC Sport. 2009-04-28 [2009-06-25] （英语）. 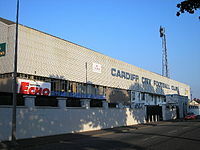 ^ Bluebirds ground named 'The Cardiff City Stadium'. walesonline. 2009-03-21 [2009-06-25] （英语）. ^ Cardiff 0-3 Ipswich. BBC Sport. 2009-04-25 [2009-06-25] （英语）. ^ Fans' farewell Ninian Park party. BBC News. 2009-05-16 [2009-06-25] （英语）. ^ Stadium roof's piece of history. BBC News. 2009-05-04 [2009-06-25] （英语）.